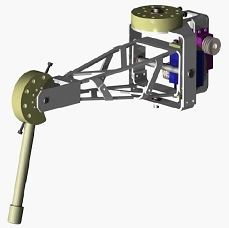 An 18-DOF hexapod robot was completly designed and developed at the University of Florence by Andrea Foschi in 2005. It was later tamed by Marco Natalini and Alessandro Mambelli using Evidence Srl's FLEX Light board and ERIKA kernel. The main purpose for adopting FLEX is due to its low-cost development kit that permits easy addition of features i.e. sensors and behaviour. 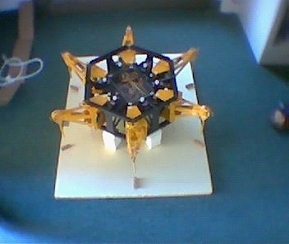 Since then, a number of students have worked on this hexapod. The future version would use the FLEX Full board. 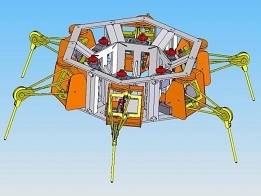 In the orignial version, kinematics of the legs were resolved offline; and a lookup table was uploaded on the target to reduce the microcontroller's computing load. In the tamed version, kinematics of the legs are resolved online using Evidence Srl's ERIKA kernel. The original version was equipped with a IC16F877A and was programmed in an assembler achat viagra generique. The tamed version uses the FLEX Light board, equipped with a dsPIC33FJ256 microcontroller. It's mechanical design uses simple aluminium pieces joined by rivets, allowing easy assembly of the kit. The next prototype, set to be released soon, will use the FLEX Full board.